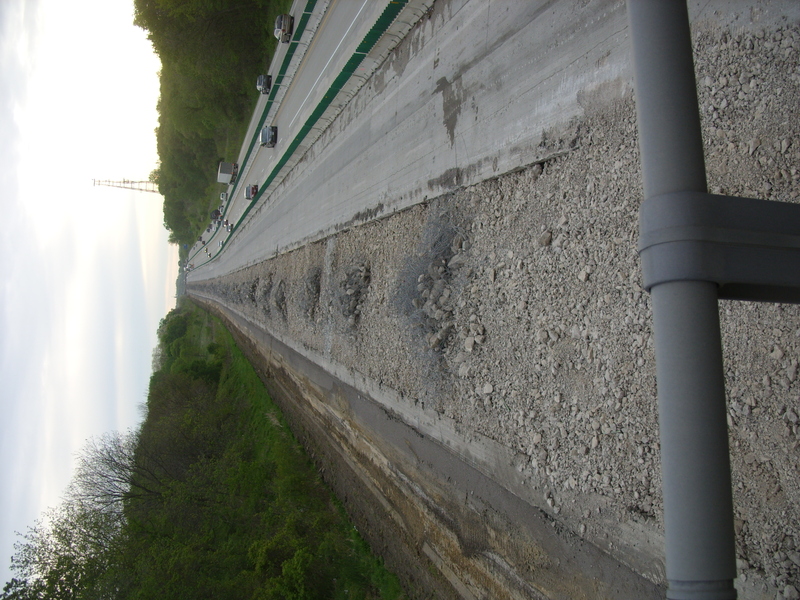 Have you noticed the work on I 80 happening through Iowa City yet? Last year they moved the lanes over, now they are breaking this section up to repave it as a bike path with native prairie grasses on the north side, and a line of trees on the south to provide shade and work as a visual / noise block from the ever dwindling motorized traffic. The next phase will see the lanes in between the cycle path and the interstate torn out and train tracks will be put down for the highspeed rail system. Now that we are past our 3 year birthday it is time to write the thank you cards. Thanks for the beer deliveries! And them pastries, too! But most of all thanks for bringing your business here and giving us the opportunity to do what we love. We have said it before, we could not do this without You. So thanks, You, and here is looking forward to more years, like about 25 more and we can retire. Ugh! Now to the please part. You may have heard that right next door to us a new restaurant just opened last week? The Trumpet Blossom Cafe is all vegan awesomeness! Owner Katy used to be part owner of the Red Avocado but when that got run over by the bulldozer of “progress” she set out on her own, and landed right here. 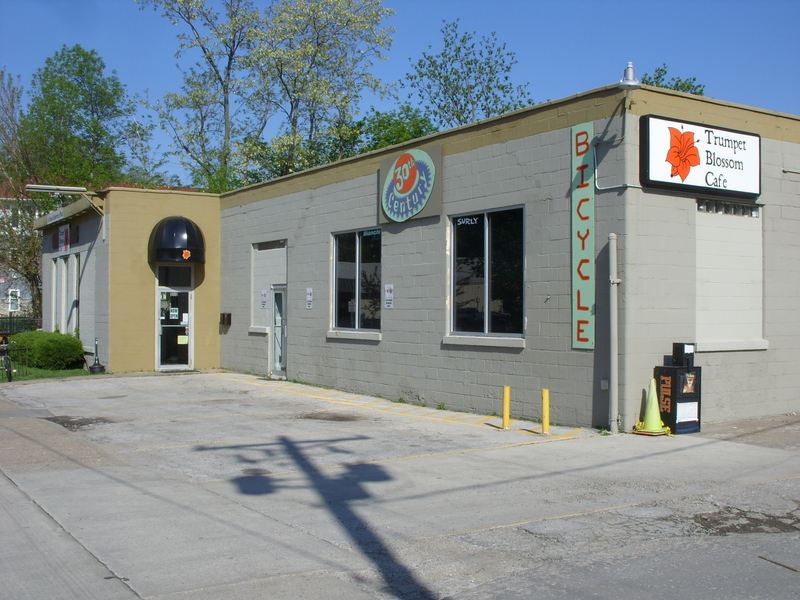 We loved the Red Avocado and were big supporters of everything they did, and now Trumpet Blossom is serving up more of the same, along with a bar, patio, lots of live music, and great espresso roasted locally by our old neighbor Wake Up Iowa City. So please help us build this little community down here and give the Trumpet Blossom a try, you’ll be glad you did! 3 Year Anniversary Sale: Go! As we continue to figure out our new space things are changing faster than bike industry marketing trends. For instance, our version of a disco ball, call it a disco bar. 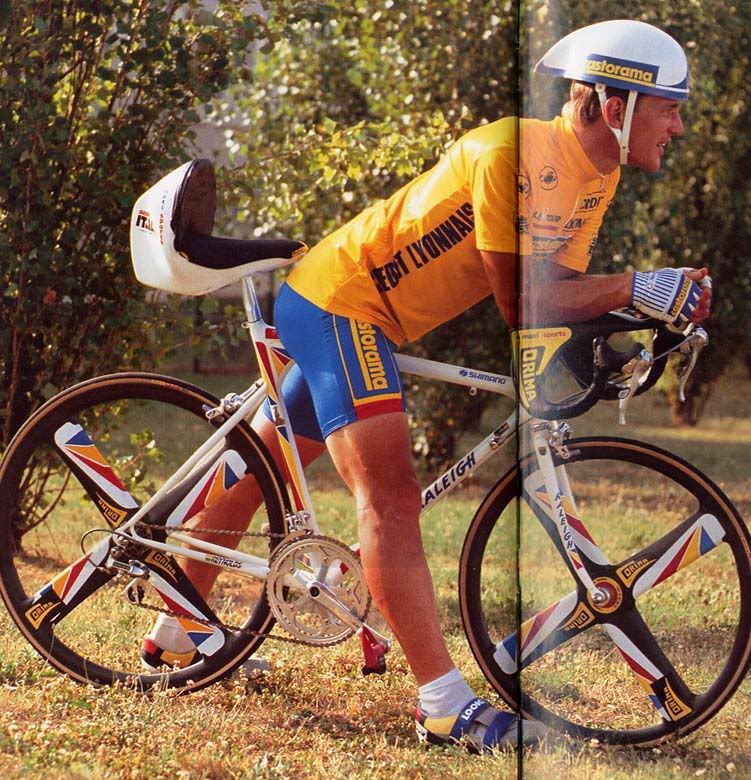 This-hi-vis-aero-extreme component was the precursor to this kind of thing. And is not for sale! 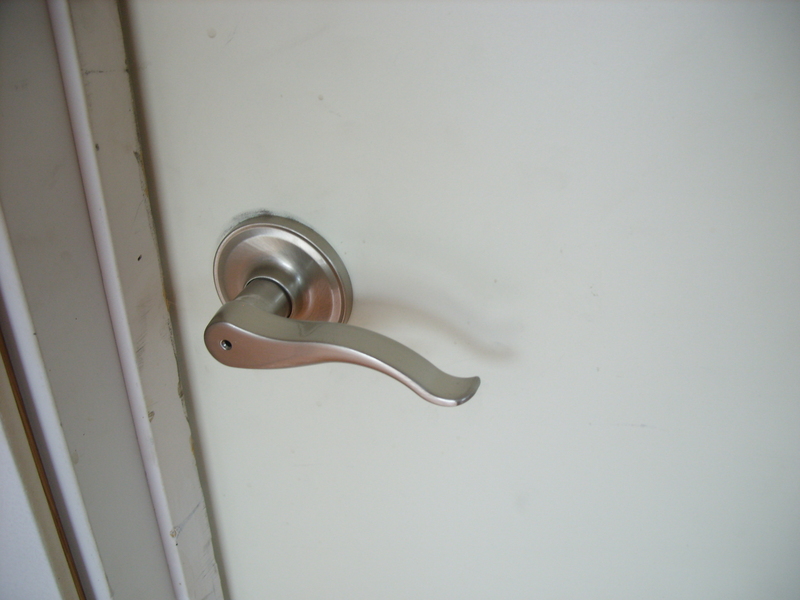 We also got a lever style doorknob to access the storage area. Okay, pretty boring to look at, but easy operation for when the hands are full gets us all excited. 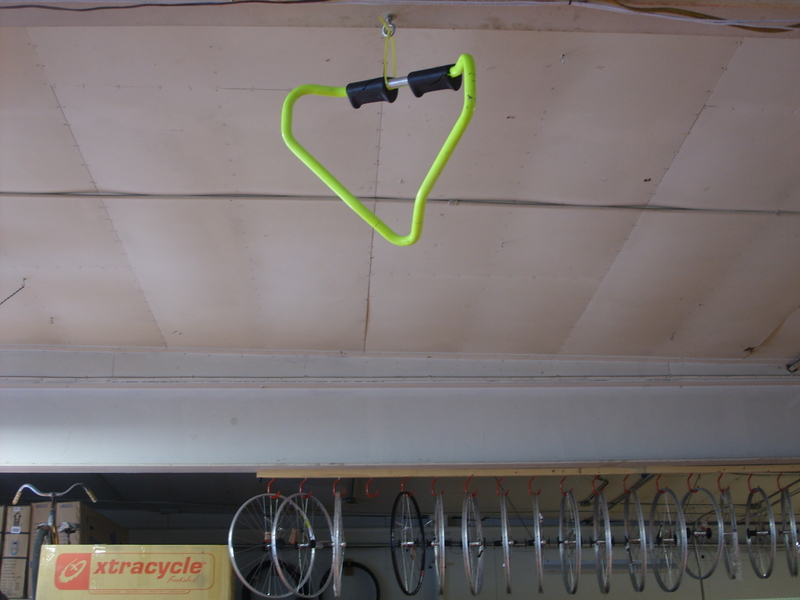 And we also put up a couple of shelves for bike in window display, plants, and parts washer. Starting to look the way we hoped it could, and just in time for our 3 year anniversary! 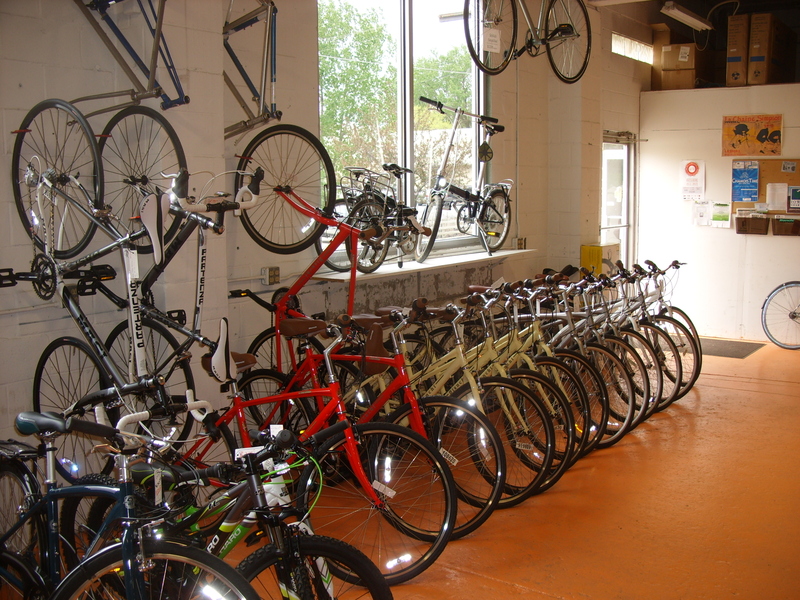 Yep, this Saturday will mark 3 years since we pumped up our tires and opened our doors. To celebrate we are having a sale. In addition to the stuff on our Sales & Specials page we are marking all in stock Marins down 15%! And all in stock Arkel bags 15% as well. Sale is on until we close on Saturday, so come on down and see us. And while you are here you can check out our new neighbor, the Trumpet Blossom Cafe, opening on Wednesday this week, for all your “that was the best meal I ever had in my whole life” needs. 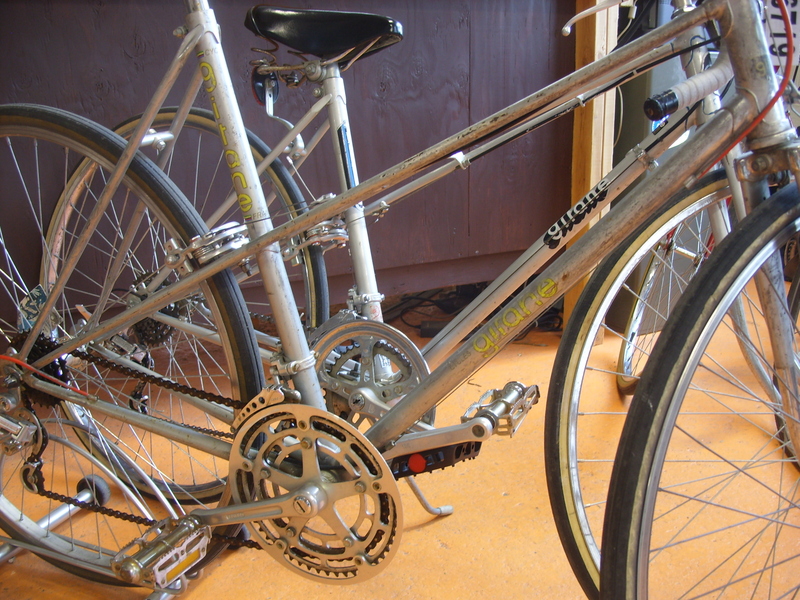 It is not everyday we have an old Gitane mixte come through the shop, today we have two! And how cool is this single speed? 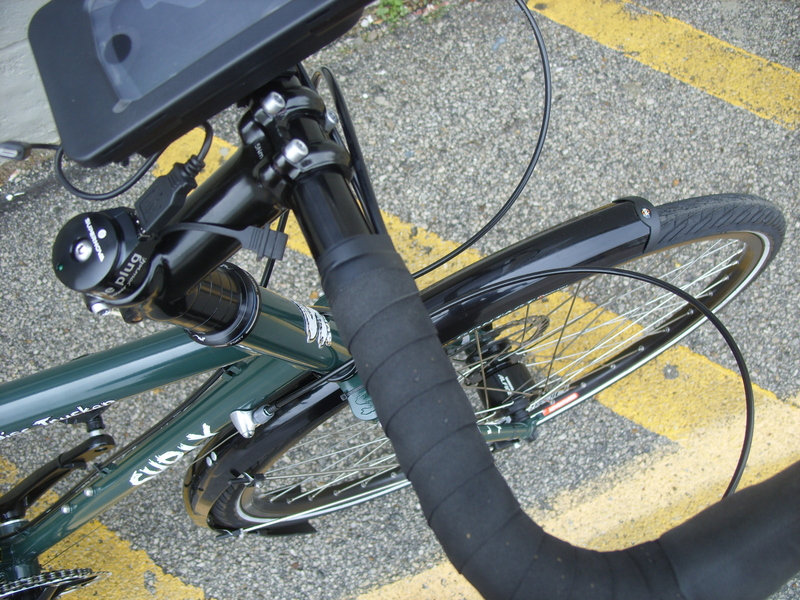 Already has MK Fenders to complement the honey Brooks saddle and bar tape. 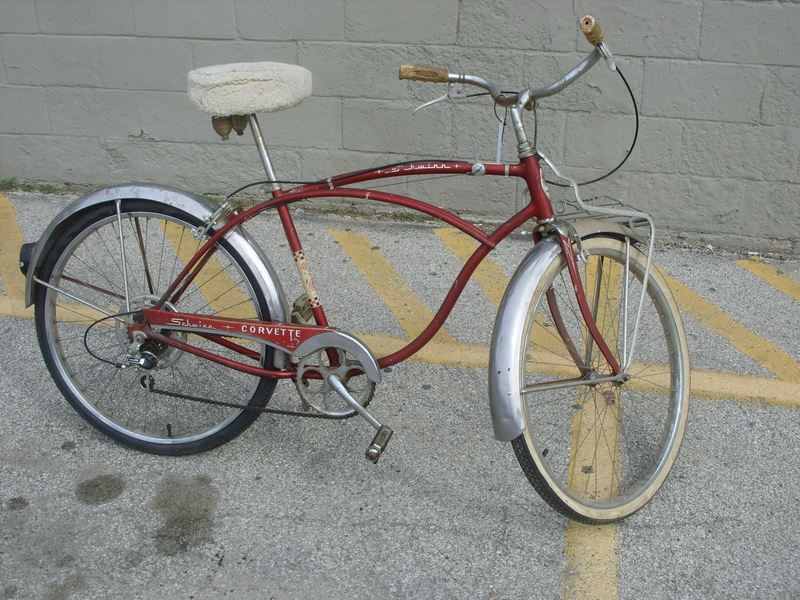 Now with a set of Ironweed BP Alyce panniers on the back. 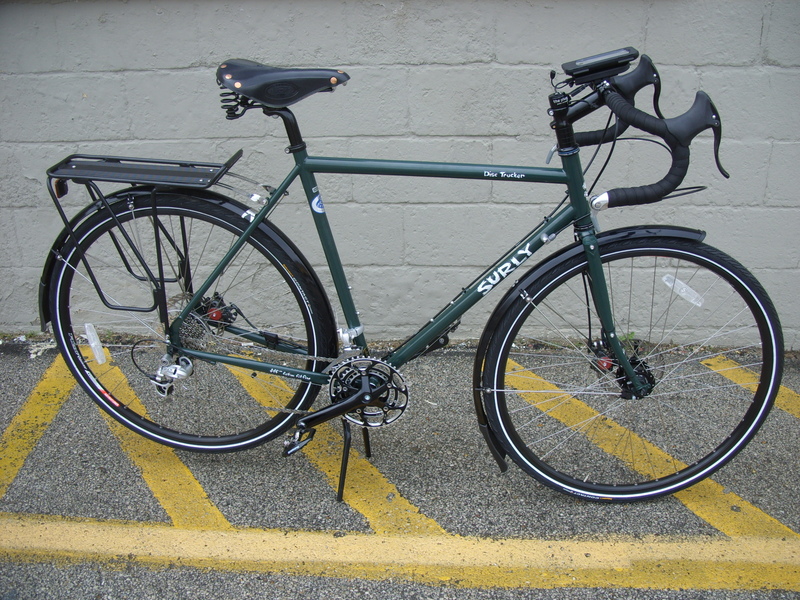 Our first Surly Disc Trucker was a quick sale. The new owner had even bigger ideas for his touring bike than just disc brakes, racks and bags. 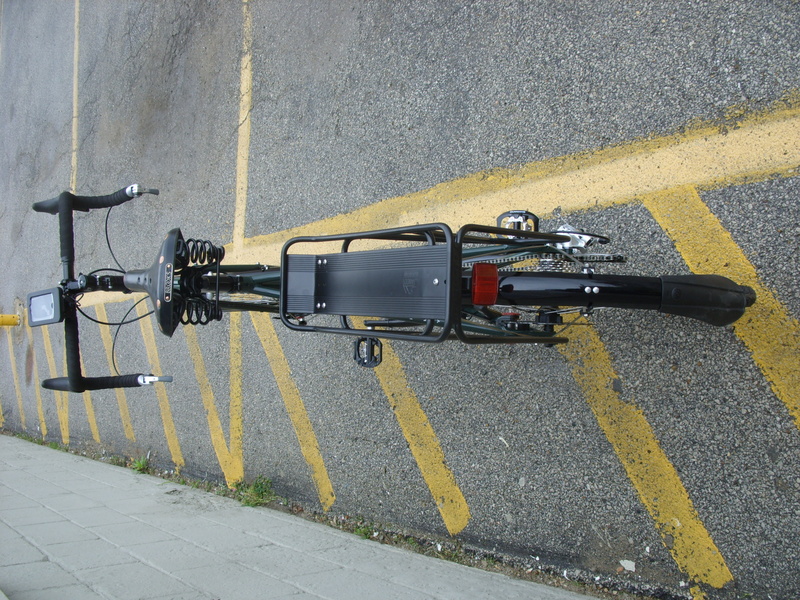 We rebuilt the front wheel with an Alfine generator hub which is sending power up to The Plug. What is The Plug, you wonder? A nifty little gadget made by Supernova that replaces the topcap of the bike and has a USB port on the front to power lights, recharge phones, amaze people. This is going to power an iPhone as well as a recharging station for it made by Wahoo. Where am I, how fast am I pedaling/going, and what song should I listen to next are thoughts commonplace to the iPhone equipped cyclotourist. 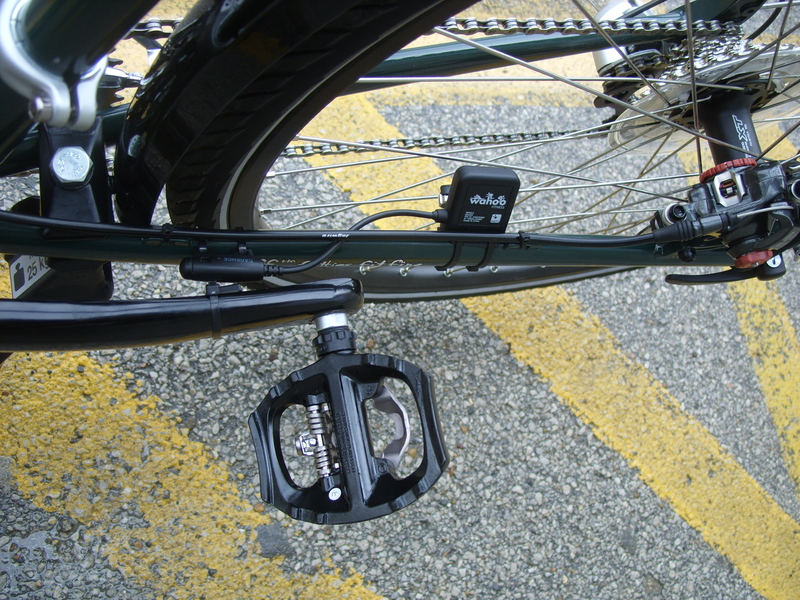 Wireless speed and cadence gadgets wriggled around the disc brake cable. 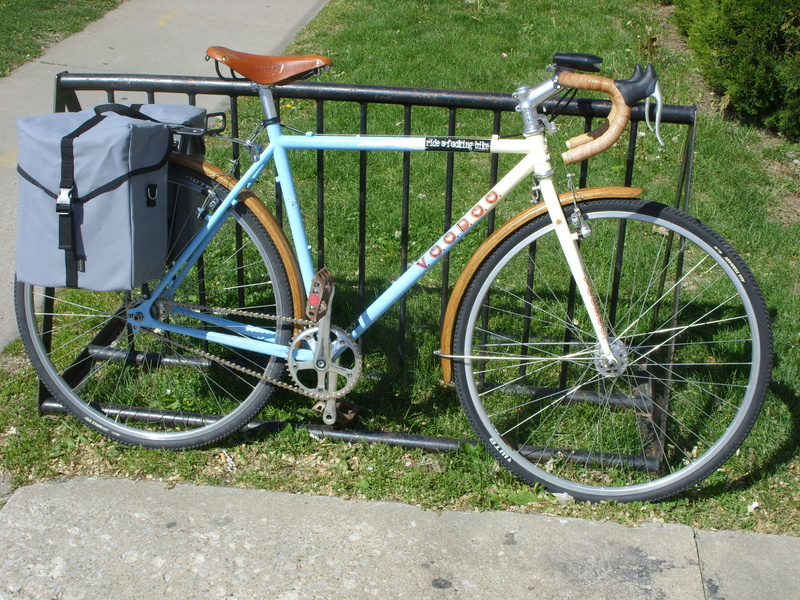 Brooks Flyer Special, Jaandd Expedition rack, front rack to be determined, bags ordered – and away it goes! This Corvette goes zero to sixty in sixty years. We replaced the rear tire, the owner got tired of having to clean the white wall after every time he peeled out. 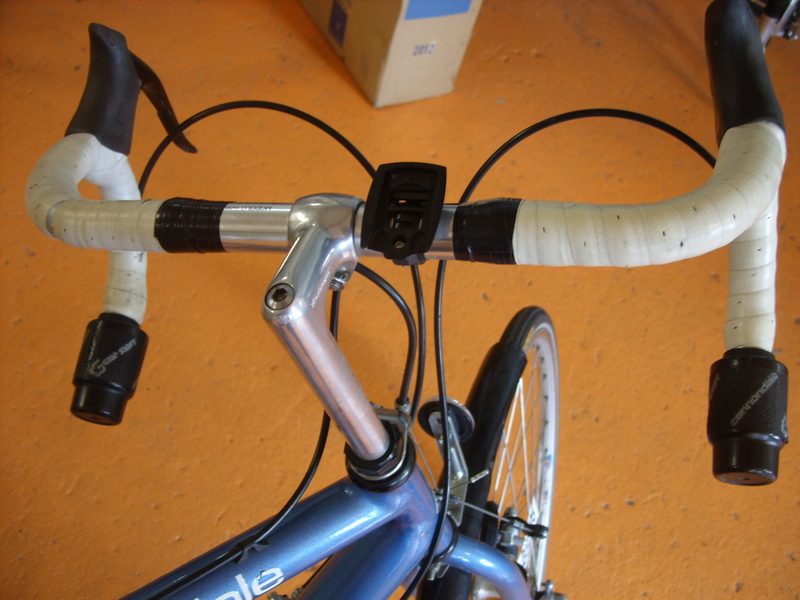 And how about this Grip Shift! Back in the day this was sti.